Back home and ready to paint! I’m back home from our little trip to the States, we had some amazing weather and were able to see a lot. Granted, the paces we visited were not new to me and since we had someone along who had never been there we did all the touristy things again but it was fun anyways. We even got to visit some of the museums in DC and we went to Georgetown, if only for dinner. Now that I’m back I am very eager to get back to work, my F1 project is begging to be finished and I am very eager to go out and shoot some material for my boroughs project. I do however still have a guest in the house for another week. Usually I love working from home but at times like this I wish I had my studio elsewhere. I just find it very hard to concentrate when I know there’s someone in the house (someone other then my husband that is). I am very protective of my creative space, I do not like to let people in there, especially when I’m in the middle of a piece. I know this sounds kind of weird, especially since in this case the piece I’m working on has been used for my presentation at the Beaconsfield Artists’ Association, so there’s a lot of people who have already seen it in several stages of un-doneness. That may be the case but I still don’t feel comfortable letting people see it now. This makes my situation at the moment a bit difficult because I am so eager to get to work on the piece and to finish it, but I’m not entirely comfortable doing so at the moment because I’m not alone. But not being alone isn’t going to stop me! I am going to get it there, turn up the radio and block out the outside. There’s just going to be me and my painting and nobody is going to interfere today! 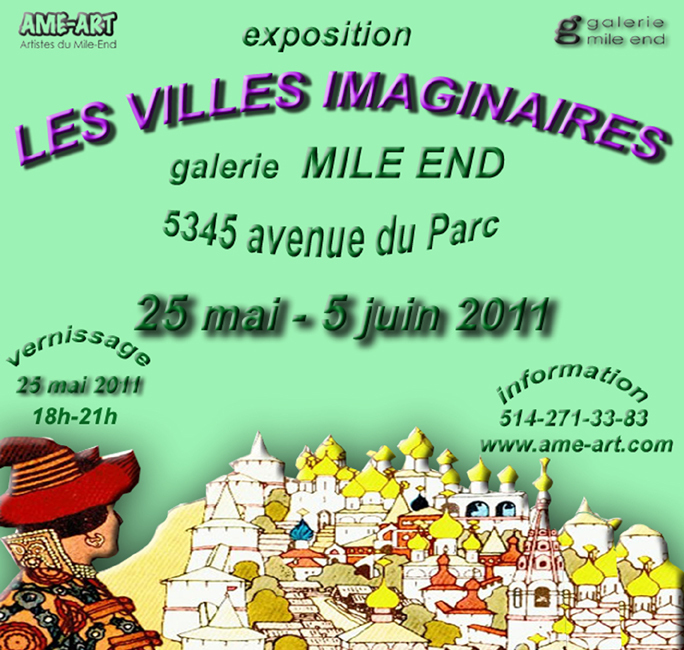 It is early summer in Montreal and early summer means visitors. It’s always a lot of fun when people take the time to come and visit us here in Canada but as an artist it’s oftentimes frustrating as well. This time even more so because I feel like I haven’t had the time to do some decent painting in ages with my show and the preparations for my presentation and all that. Yesterday I did have a little time to do at least some work on my F1 project and my lovely husband is taking our guest out for the day so I will have the afternoon today as well. But tomorrow we will leave for a short trip to the states and then our guest will stay for one more week when my husband goes back to work so the entertaining will fall to me. 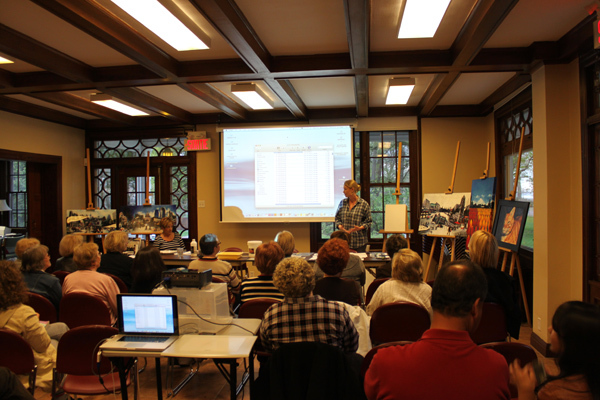 Yesterday I held my artist presentation at the Beaconsfield Artists Association, I was a bit nervous at first but there was a great crowd of artists and I felt welcome and at home right away. My work consists of a lot of different stages which helped me to structure my presentation so that everyone could follow along easily. I think it was very successful, the artists seemed to enjoy it and were very involved, asking questions during as well as after the presentation. 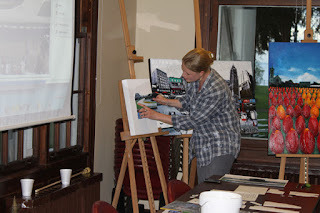 I had a great time sharing my experiences in creating my artwork. It was very nice to have an audience of artists because they seem to understand the way I think, something that isn’t always the case with other people. 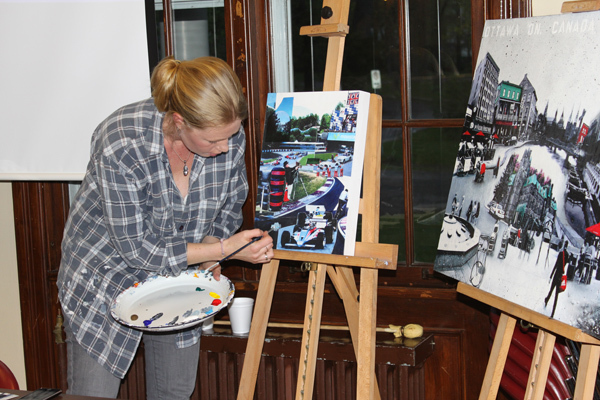 I would like to take this opportunity to thank the Beaconsfield Artists Association for inviting me, I had a great time! I was very fortunate as well to be part of last nights meeting because there was somebody there form the Le Nichoir Wildcard event. Le Nichoir is a wild bird rehabilitation center. They will be holding a fund raiser on November 19th where they will be selling artworks which will be donated by the artists. I thought this was such a great cause that I immediately decided to participate in this years fundraiser, so that will be something I will be working on in the next couple of months as well. 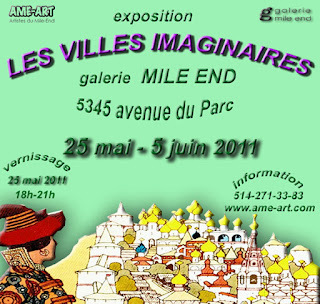 Tomorrow I will be dropping two of my works off at the Mile End gallery for ‘Imaginary Cities’ a group show that will run from May 25th to June 5th so if you are interested in seeing some of my work in real life, come to the vernissage on may 25th from 6-9pm or visit the gallery between may 25 and june 5th. I will be at the gallery myself at selected day during the second week of the show, I wil announce the dates on facebook as soon as I have more information so if you haven’t yet done this, please become a fan! The past week has been devoted to the preparations for my presentation at the Beaconsfield Artists Association which will be taking place on the 18th of May. While doing this I have made some surprising discoveries about myself and my work. I think I’ve mentioned before that as an artists I didn’t use to think that the stuff I was creating was a big deal. I used to say it was easy just because it feels easy by the time I have finished a piece. It’s like giving birth in a way, not that I have any experience with that but they always say that you forget all they painful nasty things about giving birth and only remember the good parts. My creative process kind of works like that in my head, at least up until the point where I started this blog because writing about my process has opened my eyes to those frustrating moments that get forgotten in the end. Preparing for this presentation has, like this blog, forced me to analyze my creative process. And once again I am amazed at how much more technical it is in reality. Even with the realizations I have had about my creative process in the past due to writing about it in this blog, in my mind my creative process still seems way less complicated then it is in reality. There are so many little things I do on auto pilot that I now have to analyze and explain to other people. It has been a very interesting journey. Because there are a couple of different phases about my creative process, I decided to create a piece that consists of three separate panels. These three panels will form one image when the piece is finished, but during my presentation they will give me the possibility to show the different stages of the process. This did mean that I had to create the entire composition upfront and get all the panels to a different stage. This has made it a lot more complicated to get this piece done because I had to think about which things I could and couldn’t do to my separate panels. I ended up taking notes during all the different steps and it has been quite a puzzle to get everything right. There are a couple of stages that require some drying time so that had to be calculated in as well, something that almost caused me some problems. Luckily I was able to get all the elements finished in time. When you work on a piece in your studio you have all the materials you use at your fingertips, my presentation will not be at my studio however, so I had to make a list of all the things I use during every stage of the process. This was easy when it involved the parts of the process that I had to prepare upfront. But the painting stage for example is something I cannot start upfront and since this piece is in full color I will have to decide now which colors of paint I am going to bring. Usually when I start painting I just start at whichever point feels good, now I have to think about which parts I will be painting during my presentation so I can make sure that I bring the right paints. Is there a ‘right way’ of doing this? Do I have to start at a certain point? is there a particular order in which you have to paint it? All these questions and more have crossed my mind in the past couple of weeks. I am not a very technical person, and I don’t do very well with ‘rules’ when I’m creating. When I cook I never ever follow the recipe to the letter, I always add something or change it somehow. This presentation has forced me to basically ‘write’ a recipe for my creative process, something that hasn’t been very easy. But it did give me a newfound appreciation for myself and my creative process. All in all it has been a very interesting journey which I think my creative process will benefit from in the future. As an artist you’re always evolving. Analyzing yourself like this once in a while, I think gives you a great insight in your creative process and will help you to keep that evolution going. 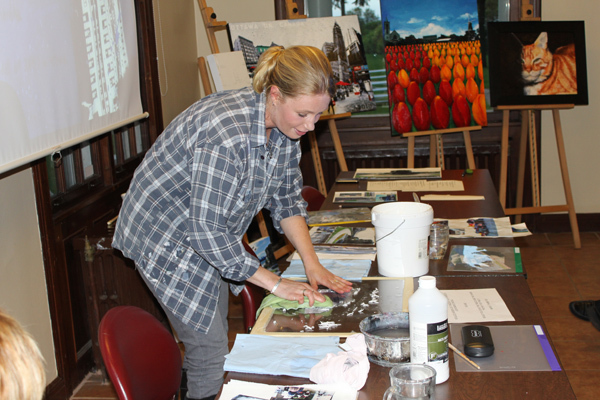 My presentation will take place on May 18th at the Beaconsfield Artists Association. Wish me luck! Isn't that giving away your secret? A couple of weeks back I was invited to talk about my work to a group of about 50-60 artists at the Beaconsfield Artists Association on the 18th of May. In the weeks leading up to this I have had a lot of comments about this, the most common one being; “isn’t that going to give away your secrets?” I understand where that question is coming from but I do not agree with it. The technique I use in my work is not this big secret I’ve been developing for years and years. It is a technique that can be found in books or online, I myself learned it at a course I took last year. Granted, I worked on it to fit it to my needs and I am endlessly grateful to the man who taught it to me but it is not a secret. The thing that makes my work special is me, I am the one who takes the pictures, I am the one who chooses which pictures to use and I am the one who decides where everything needs to go. It’s not the technique that makes the work, it’s the way I bring everything together that is unique and I don’t think that is something you can teach, or steal for that matter. When I was in art school I was in a class of about 20 people who at times all got the same assignment and it always surprised me how many different solutions there were, even when working with the same materials or techniques. Afterwards we would all display our work together and discuss it and there would always be pieces that I would envy; if only I had thought of that! But that’s how you learn as an artist, the next time you would consider that idea or technique and run with it. That didn’t mean that you would copy the work of your classmate or steal his idea though. Because a technique is just that, a technique, a means to an end. It’s what you yourself do with it that is going to make it into art. Does that mean that I’m not the slightest bit worried? well no. I am worried, I think as an artist you always are, a little bit. But if you are afraid that people will copy you then you should lock yourself away in your studio and avoid contact with the outside world at all times. Don’t post any of your work online, don’t talk about it, write about it, definitely don’t blog about it and most of all don’t show it to anybody. When you let your work go into the world there’s always a chance that someone will copy it so you might as well not worry about it and if it happens deal with it when it comes or consider it an honor, if people think your work is worth copying it must be really good right? I see a lot of works by other artists, I go to museums, browse art online, read artist blogs and work together with other artists when doing courses or group activities and I get a lot of ideas from that. It is a very inspiring experience that I wouldn’t be able to do without as an artist, I take away a lot of ideas from that. But I use those ideas in my own way. The artist is like a filter, you can only experience the world in your own way and therefore only create your own artwork. This is something that is especially true for my work, because I show places that I have visited and experienced and I choose to show the elements that were most important to me. That’s why I will gladly talk about the way I work on May 18th at the Beaconsfield Artists Association and I hope I will inspire a lot of artists to run with my ideas in their own way, wouldn’t you? Now that my solo show has finished I should have time o plenty, that is not the case though. There are so many things fighting for my attention right now that I have a hard time figuring out which things should have the highest priority and what needs to be done first. When I was preparing for my show things were simple in a way, I had a of of stuff to do, true, but everything for my show had priority so I didn’t really have to think about it. Now things seem a lot more complicated. I have several things going on right now. Most important are the preparations for a presentation I will be giving at the arts association of Beaconsfield on May 18th, there is a lot of prep work that needs to be done for that and the 18th is pretty close so this should be on the top of my list right? Thing is, yesterday I had a meeting with the woman who helps me with my marketing and every time I come back from a meeting with her there are a thousand new things that I need to take care of. We talked about doing a minor redesign on my website to incorporate my web store and make things more organized. When things like this pop up, my mind tells me that they have to be done right away, which is kind of distracting since I need to be preparing for my presentation. Now I know that the changes on my site can be done at any time and I shouldn’t expect them to be done right away but it is just something that keeps nagging me in the back of my mind until it’s done. On top of that I have decided on my new project, the one on all the neighborhoods on the island of Montreal and I’m really eager to start on that. Especially since I am planning to do a solo show on that series early next year so I should definitely get started if I want to be finished in time. Earlier today I visited the Viva Vida Art Gallery where I have some work on consignment and they are showing an interest in doing a solo show later this year which means that I will have to create some new pieces for that as well. And then there are all the other small things that always need doing, like keeping up with this blog, sending out packages to galleries and entering art shows. All of them minor things but still things that need to be done.